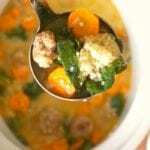 Easy Italian wedding soup recipe your whole family will love and just costs about $10 to make. Throw it all into your crockpot and it cooks all day! 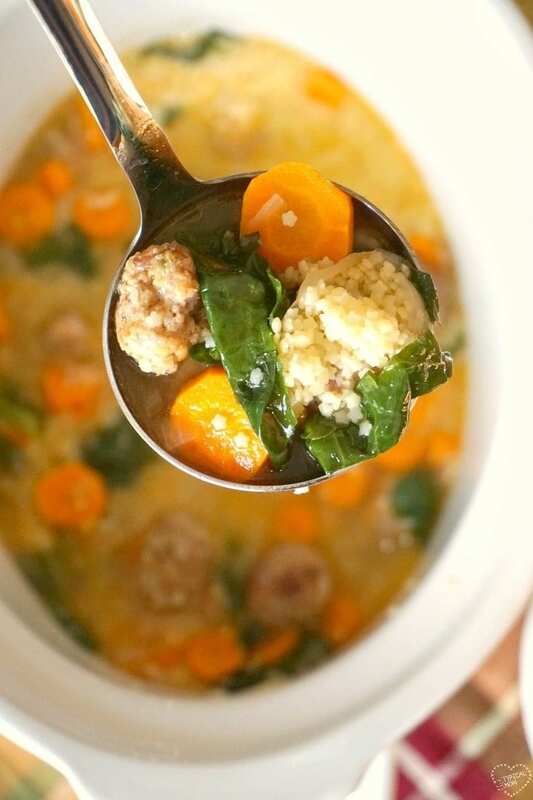 Seriously, this easy Italian wedding soup recipe is my all-time favorite meal. Especially when the weather cools down I love crockpot soup recipes to eat dinner.I also call it a real win because everyone in my family gobbles it up AND it only costs about $10 for the entire recipe! Let me show you how easy this crockpot Italian Wedding Soup is to make. You’ll need an onion and carrots from the produce aisle of Kroger, and if you want to add some greenery pick up a small bunch of escarole (looks like lettuce) to add at the end as well. Italian Sausage is incredible for this soup because it’s packed with flavor which amplifies the yumminess of this soup. First we’re going to prep everything that will then go into our slow cooker. 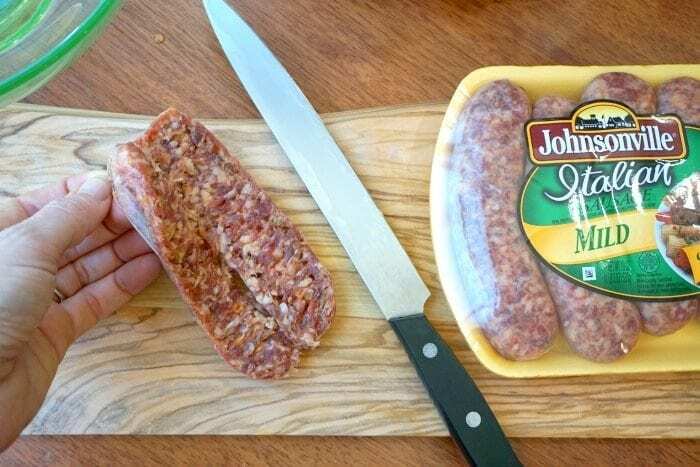 Cut your carrots, dice your onion, and take the casing off of all 6 of your Johnsonville sausages. I then make meatballs just like I would make my meatloaf. Except I shape them into small spoon-sized bites. Cook them either on a baking sheet or on the stovetop. It’s a great flavor “swap” from using ground beef because it adds an incredible flavor that permeates throughout this easy Italian wedding soup recipe. Once all that is done you’re going to add it all (excluding your Barilla pasta and escarole) into your slow cooker with your chicken broth. Then about 20 minutes before you’re ready to serve your Italian Wedding Soup add your choice of noodles, and if you choose to add escarole add it now too. If you don’t have all day you can make our Instant Pot Italian wedding soup too…either way you make it is delicious!! 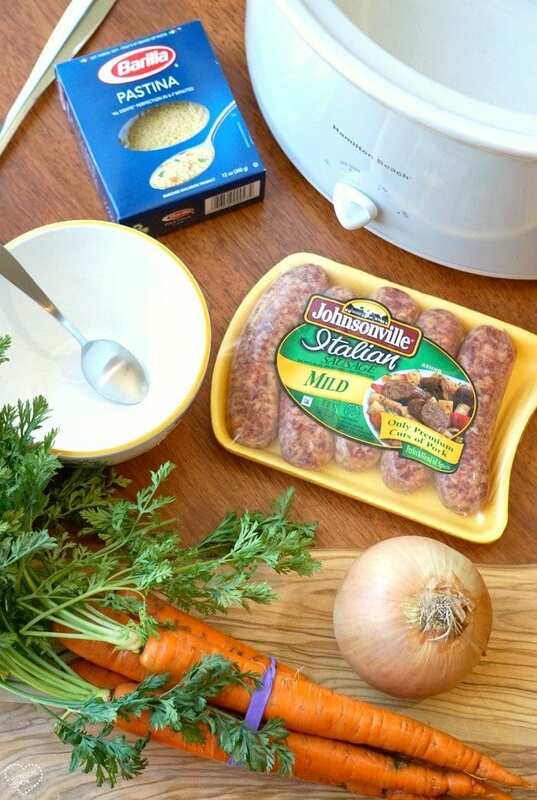 Here’s the printable recipe and a video showing you how to make Crockpot Italian wedding soup. 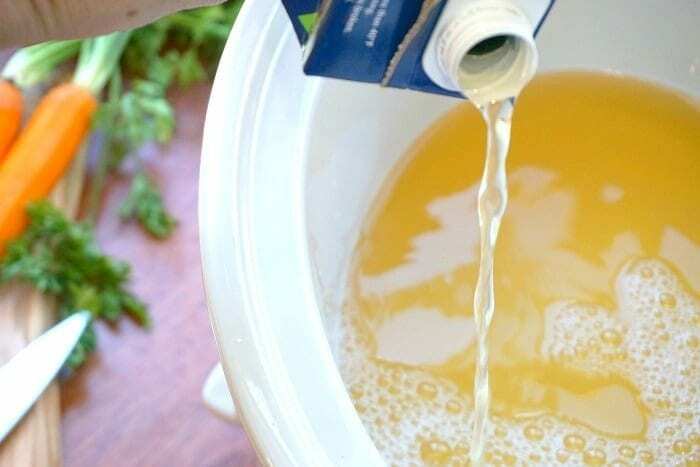 First add chicken broth to your slow cooker. 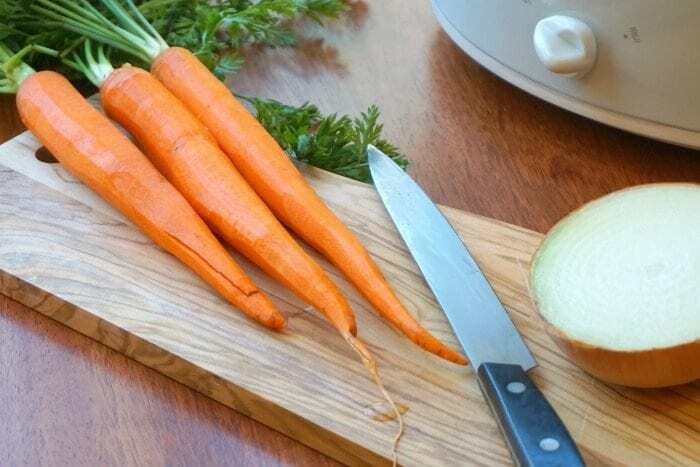 Chop your carrots into similarly sized pieces and dice onion, add to crockpot. Remove casing from sausages. Add sausage meat, egg, garlic, parmesan (optional), and bread crumbs into a bowl and mix well. Create small meatballs that are about teaspoon sized and cook on a cookie sheet or put 1 meatball into each hole of your mini muffin pan (I do it this way) in the oven for about 15 minutes at 350 degrees. Once cooked add to crockpot and cook for approx 6-8 hrs. on low. About 15-20 min. before serving add pasta and chop about 10 pieces of escarole (I just use dark ends) into strips and add that too. Serve! You can’t go wrong with pasta in soup! Isabella a box of that lasting in my pantry right now, and I think this is the perfect recipe for it! This looks so good…I would love this for lunch today! Italian wedding soup is one of my favorites. Pinning! Italian wedding soup is one of my favorites. This recipe looks amazing. 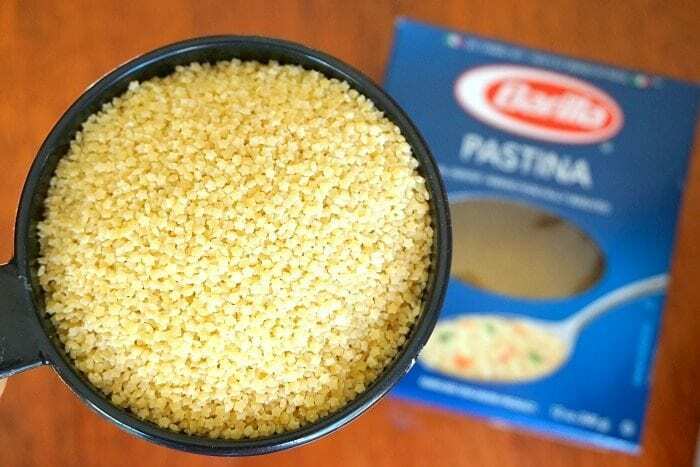 Awe, pastina is a favorite! I love the sound of this soup!! Such a wonderful comfort meal. YMMY! I have never heard of Italian wedding soup! I can’t wait to try this!!! I am always looking for new soup recipes! Yum! I love Italian Wedding Soup! 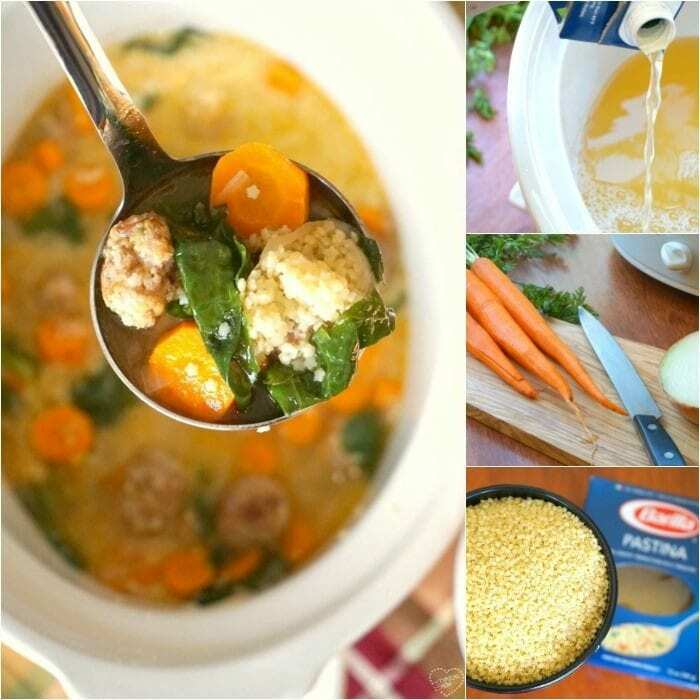 Your Italian wedding soup looks absolutely exquisite Justine – the fact that it’s easy and budget friendly even though it’s so exquisite looking, makes this my kinda recipe! Your soup looks absolutely delicious and the vegetables looks as tho they’re cooked perfectly! YUM!! !